Investigators detained the famous Nigerian comedian at the airport, accusing him of swallowing narcotics before trying to board a flight to Paris. But after more than two weeks of observation, Baba Suwe has given up no drugs. Baba Suwe‘s life has been reduced almost to a potty-humor joke after drug enforcement agents arrested the 53-year-old actor on suspicion of hiding drugs inside his body. Television news programs have brought on analysts to discuss the actor’s bowel movements. And writers have compared the incident to when police arrested late Afrobeat legend Fela Anikulapo-Kuti on suspicion of ingesting marijuana, which the musician later memorialized in an unprintable song and album title. However, Suwe’s defense lawyer says the case also has more ominous implications for Nigeria‘s criminal system. That “somebody of Baba Suwe’s popularity, somebody of his standing in the Nigerian society, somebody’s who’s so famous can be hauled into detention without any attempt of filing a charge against him, that tells you we may have several thousand people languishing in (drug agency) detention centers with no access to justice,” Bamidele Aturu said. Baba Suwe, whose real name is Babatunde Omidina, is a popular figure in Nigeria’s robust national film industry known as Nollywood. He provides comic relief in films as a butler or a security guard in some films, or as the lead actor in movies spoken in his native Yoruba language. On Oct. 12, he arrived at Lagos’ Murtala Muhammed International Airport to board an overnight Air France flight to Paris, where he was to host a naming ceremony for a newborn. Agents of Nigeria’s National Drug Law Enforcement Agency pulled him out of line for a further screening, officials said. Such searches remain common in Nigeria, as drug enforcement agents conduct selective searches, usually focusing on travelers who fit the profile of a possible drug courier. It remains unclear why agents specifically pulled Baba Suwe out of line, as his lawyer said Tuesday that their selection came after authorities received “information” about his client. Agents put Baba Suwe through a full-body scanner at the airport that detected a suspicious object inside his body, the agency has said. They detained the actor and newspaper headlines the next morning blared that the actor had been caught with cocaine inside his body. Except no drugs have come out. 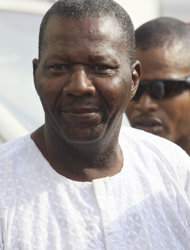 On Tuesday, Baba Suwe appeared in a federal high court in Lagos to challenge his continued detention without charges. His case brought out fans who lined the court compound’s fence, peering through the slates to catch a glimpse of the diminutive star. “As a public person, it’s an embarrassment to him and his fans,” said Sunday Iyip, 43, who works as a security guard. The case also has proven to be a high-profile embarrassment for the National Drug Law Enforcement Agency, which parades a series of suspects before journalists to show its efforts to stop drug trafficking. Despite its campaign, Nigeria remains a major transit point for illegal drugs. Between January and October 2010, Nigeria’s drug agency seized more than 400 pounds (some 180 kilograms) of cocaine and more than 90 pounds (more than 40 kilograms) of heroin in Lagos, home to the nation’s busiest airport, according to a recent U.S. State Department report. Experts believe much more slipped out of the country via drug mules to airports in Europe and the U.S.
Femi Oloruntoba, the drug agency’s lead prosecutor, said Tuesday that he didn’t think the Baba Suwe case had hurt his agency’s image. “With all the scans and the expert opinion, it’s reasonable for us to hold onto” him, the prosecutor said. Yet inside the court Tuesday, Justice Yetunde Idowu offered harsh criticism for holding the comedian without charges. She ordered Baba Suwe to be released Friday on $3,300 bail so long as he doesn’t excrete any drugs. “Mr. Omidina is due for release,” Idowu said. And so Baba Suwe left the court, surrounded by Uzi-carrying anti-drug agents. Outside, his fans mobbed around him, applauding him as he passed. However, even in the moment of judicial glory, the comedian couldn’t escape the joke: Those gathered offered an excrement-themed cheer in his local language.